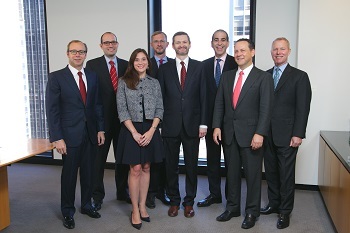 Several Wachtell, Lipton, Rosen & Katz partners, all Law School alumni, with Dean Thomas J. Miles. From left: Andrew J. Nussbaum, ’91; Gregory E. Pessin, ’05; Alison Zieske Preiss, ’06; Martin J.E. Arms, ’98; Miles; Adam O. Emmerich, ’85; David C. Karp, ’93; and Marc Wolinsky, ’80. Funded by a generous commitment from Wachtell, Lipton, Rosen & Katz, the University of Chicago Law School has fortified its position at the forefront of the study of law and economics with a new program designed to bring insight and thinking from the growing field of behavioral economics to the study of corporate governance and finance. The Wachtell, Lipton, Rosen & Katz Program in Behavioral Law, Finance and Economics will include a two-year, post-JD fellowship for an aspiring academic or policymaker, as well as faculty and student research, a speaker series, faculty visitors, and conferences. Behavioral economics takes human nature, behavior, and desires into account in a way that traditional economic models often cannot, offering scholars new tools for understanding how humans interact and economic systems function. The Wachtell, Lipton, Rosen & Katz Program initially will focus on behavioral law and economics within corporate governance and finance. “We are very pleased to support the University of Chicago Law School in cutting-edge efforts to better understand the real-world dynamics of corporate governance, and help inform the crucial debate on how best to organize the governance and management of our public enterprises for the benefit of their shareholders and society,” said Martin Lipton, a founding partner of Wachtell, Lipton, Rosen & Katz. The program will be directed by Jonathan S. Masur, the John P. Wilson Professor of Law and David and Celia Hilliard Research Scholar. Masur is leading the search for the Wachtell, Lipton, Rosen & Katz Fellow, who will produce scholarship, teach, and participate in the Law School’s intellectual community. The speaker series, which will be part of the school’s Law and Economics Workshop, will begin this academic year, and the first conference is expected to be held during the 2017-18 academic year. The program is a fitting addition to the Law School, which is the birthplace of law and economics and remains a leader in the field, both with “second-wave” empirical law-and-economics research and with the development of behavioral law and economics, which Masur described as the discipline’s third wave. In 1998, Cass Sunstein, then a professor at the Law School, co-authored what is widely seen as the founding paper of behavioral law and economics. 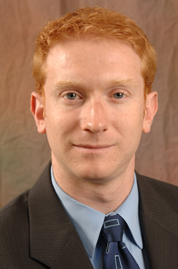 Current faculty, including Masur, continue to produce scholarship in the field. Masur said that interest in behavioral law and economics has been growing, both domestically and abroad. That was particularly evident this summer as Masur engaged with the international scholars who had come to the Law School to attend the Summer Institute in Law and Economics.